I cannot understand how people can mistake French people as being sophisticated. They never stop cutting their fingernails on the Metro. If I lose an eye to their poor public grooming, then the joke is surely on me. Their dogs are too pure bred! Come on, someone throw me a Golden Doodle! At the end of the day, all these French women are trying to emulate Coco Chanel. That is, like, so 100 years ago. I’ve never cared much for dog poop anyway. Yes, the buildings are majestic, but at the end of the day, they are all just so old! After 5pm, every other person is carrying a baguette. Way to break the clichés, Parisians! But wait, isn’t cliché a French word? Sarcasm is how I get through a really bad day. I apologize if you did not read the humor and if I offended you. Even if I don’t cut my nails in public ( never seen anybody doing it either) I still find this article quite offensive in a way. Because can really pin down where the irony begin and when it’s just cynical. Kind sad to sum up the city have majestic building but they are old. I mean WTF. That’s quite insulting. Maybe try being little less offensive because don’t take it on french people and Paris because you had a bad day that’s low. Really low. I REALLY don’t understand the nail clipping in public. I thought it was just me, so I’m glad to hear that it freaks you out too. Excellent! No worries, more cynicism to come. Thanks so much for reading MaryLouise! I’m in need of a heart transplant! Funny stuff! 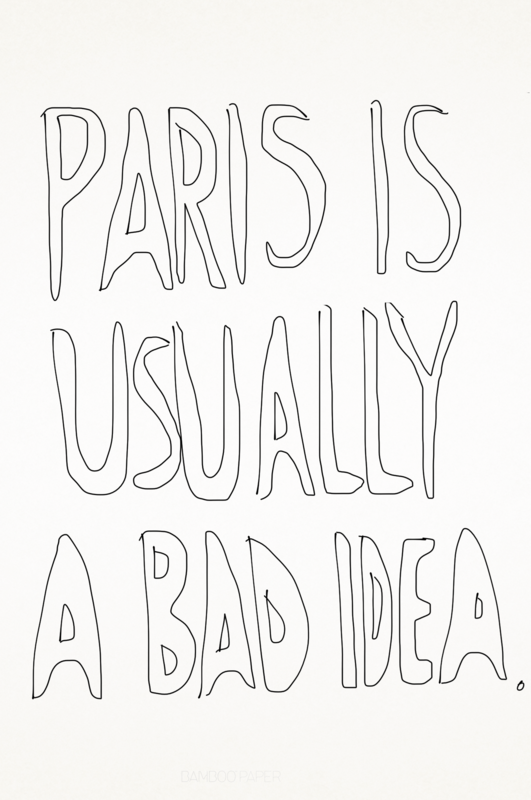 I would be hard pressed to find ANYTHING wrong with Paris! The love for everything French runs through my veins and fills my heart with pure happines. Sappy yes…true?..absolutely!